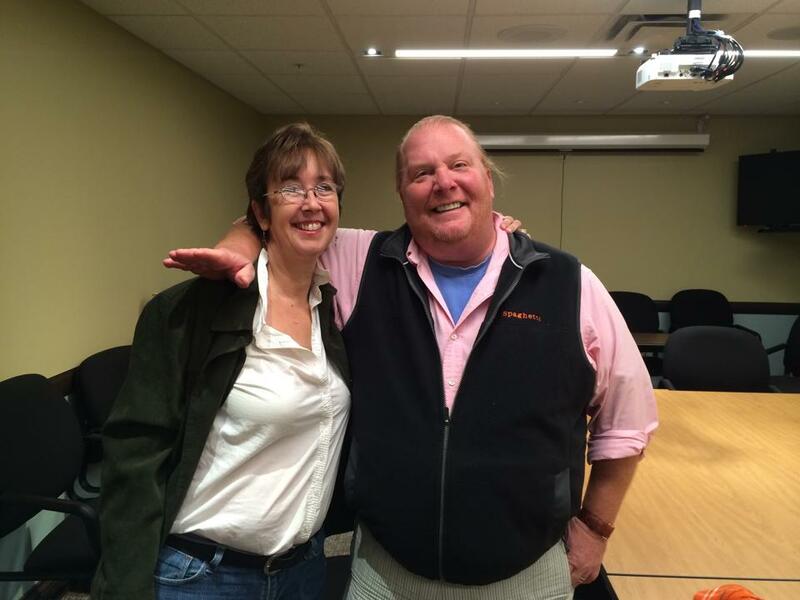 Last Saturday I got the chance to interview celebrity chef and restaurateur Mario Batali, who was signing his new cookbook at Market District in Carmel. I got the chance to inteview Mario Batali recently at Market District in Carmel. The only catch? All the local food writers in line to talk to the famous chef would only get five minutes. So I figured I’d get the most info with a list of quick this-or-that questions. And honestly, it was one of the best interviews I’ve done lately – fun for me, and I think Mario enjoyed it too. Q: Holiday dinners in general: ham or turkey? Mario: Thanksgiving, turkey. Christmas, ham. Q: Turkey – stuffed or with dressing on the side? Mario: I put the dressing on the side. Q: Sweet potatoes – marshmallows or no marshmallows? Mario: Dang. When no one’s looking, marshmallows. Other than that, no. Pomegranates. I do pomegranates on them. It’s good and its sweet, but it’s not so trashy, you know? Q: Stuffing – bread, cornbread or oyster? Mario: I grew up with oyster. This year’s cornbread. But I’ll use anything from brioche to…. This week on “The Chew” on Wednesday you’re gonna see Carla goes to this crazy bakery, and we made a stuffing with bagels. It was unbelieve. Look everyone said, we tasted it. It’s the future of our stuffings. Bagels next. Cause they held their texture so well. There was a nice little chew, right? We were using day-old bagels at this crazy bakery that’s really smart. It was outstanding. So next year, bagel. Next year I’m going to do the cuisine of the, like I always choose a theme. Last year, it was the cuisine of Alsace Lorraine, the year before it was Madrid and Barcelona. Next year’s going to be the Jewish deli culture of northeastern Europe. That will be my Thanksgiving theme. Q: Pumpkin pie or apple? Q: But cake or pie in general – cake or pie? Mario: Pie. I grew up in Washington State, and for us, the summer started when we would go out and pick two full station wagonfulls of blackberries, because they were free. So we would make enough jam and pie to last the year. We would make 52 pies and put them in the freezer, because we had giant freezers on the West Coast. Pop a pie in the oven every Sunday. Blackberry. Nothing like it. It was a lard or Crisco crust, right? And it was outstanding. Q: In general, red or white wine? Mario: Start with the white, finish with the red. Mario: Love sparkling. That precedes the white wine. I don’t really love sparkling for dessert. But a little Moscato’s nice because it’s lower in alcohol. Q: Chef knives – German or Japanese? Mario: American. I have a bunch. There’s a crazy guy on the West Coast. Kramer. Fantastic. I mean, it’s all the right stuff, but I’m pretty sure he uses Japanese steel. Q: Speaking of chefs and stuff in the news lately, Bourdain or Fieri? Mario: I love them both. Fieri’s more of a chef. Bourdain’s not a chef. He knows that. He hasn’t worked in a restaurant in 30 years. But his opinions are important. And that Fieri still responds just means Bourdain’s under his skin, which is good for the tabloids. Mario: It’s my last year. My second son is going to college next year. Mario: Sausage for Leo. Bacon for Benno. I’m a short-order cook. I have the Batali brothers’ breakfast menu still from when they 6 and 5. They get to choose anything they want, and I’ll make it every day. It’s not one thing only; they can have whatever they want. Q: What kind of eggs? Mario: For me? Over easy with white truffles and Fontina. Which is also on the menu in the fall. Benno and Leo both like scrambled and they like them a little harder than I would like them. Leo’s more of a huevos rancheros and Benno is just scrambled with cheese. Q: Speaking of sausage, I’ve read your Italian-style biscuits and gravy recipe, but do you like our biscuits and gravy? Mario: Yes. It’s rich. You shouldn’t eat that every day. I can warn all of you. You can have that once a month. Sorry. Q: Thinking of craft beer now, hoppy or not? Mario: I grew up on a hop farm in Washington State. I love hoppy, but not to the obsessive level that these hop heads bring it. I still want it delicious. Like, for me, Pilnser Urquell is a magnificent beer. Slightly hoppy for the American palate, but not like this (I can’t describe how my face is looking). It can’t be astringent. It still needs to be refreshing and quaffable. A lot of the craft beer guys think beer’s a meditative drink. No, for me it’s a glug, glug, glug, glug, glug. Q: Liquor in general – brown or white? Mario: Brown liquor makes me think I’m invisible. White liquor doesn’t make me think at all. Q: A Manhattan or an Old-fashioned? Q: Vodka or gin martini? Mario: Again, gin makes me behave like I’m invisible. Vodka, I at least have my feet on the ground. So a real gin martini is the way to have a martini, but you can’t have four. Four’s a problem.